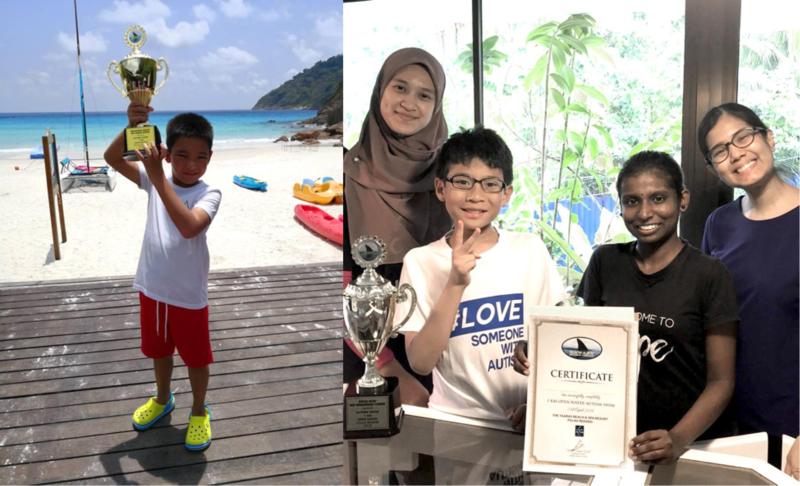 On 21st April 2018, two of our kiddos took part in an Open Sea swimming event at Pulau Redang, Terrengganu. This event coincided with World Autism Awareness Month 2018, and challenged the boys to swim a distance of 1km over an open sea! To prepare for the event, two of our boys, Daniel* and Sam* had to prepare at least a month in advance for the big day. This involved overcoming challenges unique to each boy. For Daniel, he struggled with a fear of corals in the water. Sam, meanwhile, had an intense fear of getting onto speedboats due to the speed and noise of the vehicle, despite him having to do this first to reach a distance of 1km to swim from at sea. As such, our team at EAP worked with Sam and Daniel’s family and coaches to set up strategies to help them overcome these challenges. To address Daniel’s fear of corals, the team begun by systematically desensitising him to corals. This begun with showing him pictures and videos of corals, how the corals looked like in Pulau Redang, as well as equipping him with strategies on what to do if he encountered one. For example, he could just swim away from the corals if he saw one. Leading up to the event day, Daniel and Sam’s parents were instrumental in continuing to prepare the boys for the big swim. Besides adequate sleep, rest and healthy eating, they continued to communicate expectations clearly to the boys through visuals and social stories that had been prepared by the team. These visuals were individualised based on the level of specificity each child needed. For example, Sam needed a step-by-step social story explaining exactly who he would be going with and what he would be doing at different points of the day. Daniel meanwhile had a practice at Port Dickson, Negeri Sembilan, to try and simulate as closely as possible the conditions at Pulau Redang! Finally, it was necessary that the boys be rewarded for the incredible amount of effort they put into preparing for the event! While Daniel found the experience of swimming rewarding in itself, he also had an opportunity to go snorkelling with his relatives after the event. Sam, meanwhile, had a trip to his relatives’ home in Kelantan to look forward to as his biggest reward for completing the event! On behalf of all of us here at EAP, we are so incredibly proud of these two kiddos for facing their fears and overcoming their personal challenges to participate in this 1-km Open Sea Swimming event! Here’s to hoping these kiddos have a bright future ahead of them filled with many more achievements to come!